"How beautiful upon the mountains, Are the feet of him who brings good news," (Isaiah 52:7) written at the entrance of the hospital to welcome the archbishop. 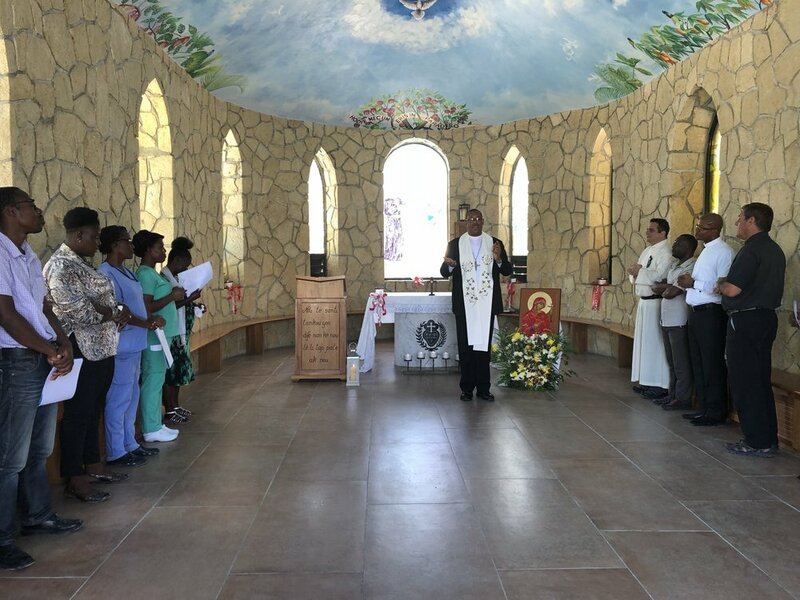 On April 25th, we were very honored and blessed to receive the visit of the new Archbishop of Port-au-Prince, Max Leroy Mésidor, who was appointed by Pope Francis three months ago, to replace our good friend Archbishop Guire Poulard. The archbishop said when he first came to Port-au-Prince, he had a list of places that he would like to visit in the city and wrote them In his agenda; he has heard a lot about both Nos Petits Freres et Soeurs and the St. Luke Foundation and for sure we were included on his list. Fr. Rick recently met with the Archbishop in the Chancery, to present himself and the works of NPFS and St Luke Foundation. He invited the Archbishop to come and meet our teams. The visit had the purpose of presenting our mission, and meeting and talking with our teams, the leaders of the missions. The Archbishop spend the first hour at St. Damien Hospital where he met Kenson Kaas, who is the National Director of the NPFS programs for children and young adults, and with Dr. Jacqueline Gautier, who is the National Director of NPFS programs for healthcare. They each had members of their team with them. The Archbishop spent the second hour at St. Luke Hospital where he met all the St. Luke leaders. Both hours started with Fr. Rick giving the history of the founding of NPFS and St Luke Foundation, explaining how leadership in our programs is modeled on the example of Jesus as servant, and how we have sustained ourselves and all those who have come to us for help through our active faith. Fr. Rick then presented the leaders, who explained their goals, achievements and challenges. These presentations led to productive and fruitful dialogue with the Archbishop. Augusnel Osme, who is the vice director of the St. Luke Foundation, introduced all the St. Luke leaders and their roles in the mission. Augusnel explained our work is a challenge, and our staffs are working with heart and strength everyday to face all the challenges. Augusnel then presented to him all the projects we have in the country, and we then receive the blessing of him . Thinking about how many patients have come to the St. Luke Hospital in desperation and suffering, and how many patients the hospital has saved from cholera and from many other diseases, we easily realize that all our work is possible because of the the compassion and grace of God. "I was hungry and you gave me food; I was thirsty and you gave me drink. 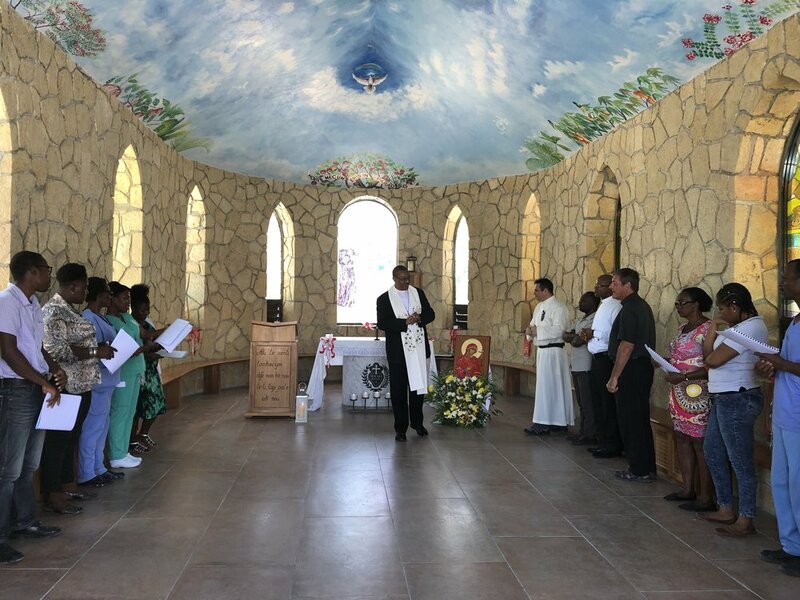 I was a stranger and you made me welcome,…….." and the Archbishop wished us prayers and success in our work, done in collaboration with and with the blessing of the Catholic Church in Haiti. The third hour was spent with Fr. Rick and Fr. Enzo in the Passionist Residence on the grounds of St. Luke Hospital, discussing the many challenges facing the Church in Port au Prince and discussing what the Passionists can do to help.